Clouds Hill near Bovington is a great place to learn about literary giant and soldier T. E. Lawrence; better known to many as “Lawrence of Arabia”. Enigmatic and enchanting, this tiny cottage is as intriguing and beguiling as the man who rescued this one-time woodsman’s cottage from ruin. Now owned by the National Trust, Clouds Hill is as good an introduction as any to the life and works of this fascinating man. Thomas Edward Lawrence was part of a generation that lived through extraordinary times. He went to extraordinary places. He undertook extraordinary deeds and, crucially, he lived to tell the tale. Born in the latter part of the 19th Century, Lawrence, like many of his ilk, got swept up in the carnage of the “Great War”. Two of his brothers were among the hundreds of thousands who died in the horror of the Western Front, but Lawrence’s own war was different and would become the stuff of legend. In the years before the “War to End Wars”, Lawrence studied history at Oxford and then worked and travelled as an archaeologist in Syria and what was then Palestine. There he learnt Arabic and got to know the Arabs and the lands they lived in. At the outbreak of war Lawrence joined the army and was sent by Military Intelligence to work in Cairo. From here, Lawrence’s war would propel him from Captain to Colonel and from obscurity to international fame - whether he liked it or not. Clouds Hill forms part of the evidence that, in fact, he liked it not. Lawrence was a complicated and complex character. And some of that is mirrored in the hovel he chose to make his home in the latter part of his life. By modern standards it was a short life, dying as he did in a motorcycle accident a few hundred yards from Clouds Hill at the age of 46. But compared to many others of his generation, cut down by the war in their teens or twenties, his life might have seemed both full and enviably long. Lawrence certainly saw his share of hardship and conflict, not in the trench warfare of the Western Front, but as a direct consequence of it. The War in Europe was consuming men and resources at a phenomenal rate, leaving little spare to fight the enemy elsewhere. Thus Lawrence hatched a plan to raise a rebellion of the Arab tribes against the Ottoman-Turks in the Middle East. It was not an easy task. First he had to try to get the disparate tribes to pull together, many of whom didn’t get on. He had to find a strategy that allowed his lightly armed rebels to be effective against organised and properly equipped regulars of the Turkish army. And he had to do it in a way that didn’t result in the massacre of the tribesmen who came to help, either as volunteers or in return for seized loot or British gold. Lawrence told his side of the story in “The Seven Pillars of Wisdom” some of which was written at Clouds Hill. It is a story of great derring-do, of a guerilla war against trains and railways: a litany of bridges blown, engines mined and stations destroyed. It is a story of how an empire and its armies were, bit by bit, harried, starved of resources and driven to confusion by a series of attacks that came hard, unexpected and often far behind the enemy lines. It is a story that makes clear that none of it would have been possible but for the skills, local knowledge and courage of Lawrence and his Arab companions. “The Seven Pillars of Wisdom” sets out how, together, they managed their camels and lived off the land to an extent that none in the regular British Army thought possible and none in the regular Turkish army were ready for, allowing them to range more widely and freely than both their allies and their enemies expected. Thus, bit by bit, success by success, Lawrence and his rebels engendered growing confidence from other tribes and from the regular army. And a growing fear within the enemy. As belief grew among the locals that Lawrence’s strategy and tactics worked, the rebellion swelled to a fully-fledged Arab movement. While growing confidence in him among the regular army provided additional allocations of rations, arms, camels - and the gold to buy yet more. It also resulted in the odd aircraft and several armoured cars. The conclusion was an all out assault of Arab rebels and army regulars that successfully pushed the Ottoman-Turks from territories they had held for centuries. “The Seven Pillars of Wisdom” shows many sides of Lawrence’s often contrasting personality. At times he is proud and arrogant, at others full of self-doubt and self-loathing. Sometimes he relishes in the successes of his companions and his camel-mounts and at others he expresses his reluctance, even disgust, to be involved at all. This internal conflict may stem from the stresses of leadership and long periods of living on the sharpest of knife-edges. It may also be part and parcel of the general horrors of war that he experienced and recounts: from being tortured to shooting his own comrades to prevent further suffering. All this on top of the daily privations necessary to live in all seasons in some of the harshest of environments. Although some dispute the accuracy of parts of Lawrence’s story, there’s more than enough in what’s unchallenged to drive anyone to the ragged edge of sanity. Add to this the fact that Lawrence felt he had made promises to the Arabs about self-rule that his Government did not keep and it becomes less surprising that, at the height of his power, success and influence he chose to hide himself away. He turned down various high honours and enlisted in the RAF as a lowly aircraftsman under the assumed name of John Hume Ross. When he was found out by the press, he hid himself again, this time in the Tank Corp at Bovington under the name of T. E. Shaw. 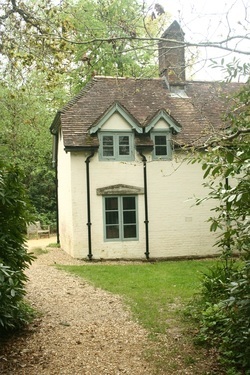 It was then he bought and renovated Clouds Hill as a retreat and a place to write. The cottage is tiny. It has few windows and sits tucked away on heathland at the edge of the Bovington Tank ranges. Lawrence re-roofed it, put in a bathroom and decorated it in a practical and unique style. Modern DIYers will marvel at what has been done with four such tiny rooms. Rooms that once would have housed a workman and his family. 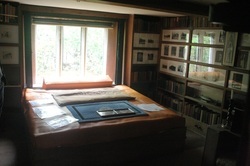 The main downstairs chamber has a large bed at its centre and is surrounded by books. 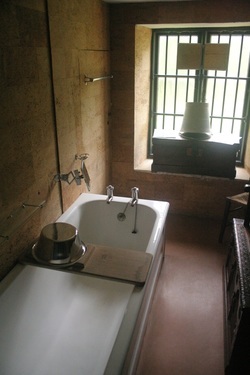 The bathroom is interestingly and tastefully tiled with cork around the walls. 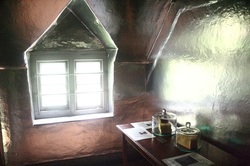 And the bunk room upstairs is a masterpiece in damp-proofing and the use of available light, being “papered” in aluminium foil. 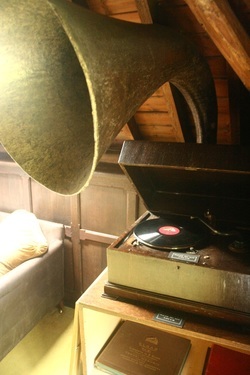 The other upstairs room is the music room, where Lawrence did much of his writing. Clouds Hill is probably not a visit for kids. It is too small and there is too little for them to do. 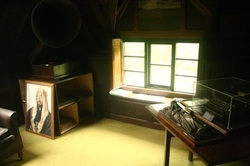 But for adults and teenage students with literary interests, this is a very small place in which one can easily get lost in thought for hours. For existing fans of Lawrence it will be a pilgrimage. For those new to him and his work, it could easily be a catalyst that sparks a new interest to read and find out more about the fascinating life of this fascinating man. It is in the nature of such great and celebrated people that every aspect of their lives are pawed over by the press and academics. Lawrence, Shaw or Ross was a man who mixed with, and counted as friends, some of the greatest people of his age. Yet he undoubtedly made enemies too. He was the illegitimate son of what would in those days have been a scandalous relationship between an already married man and a governess, neither called Lawrence. And his own “private” life remains the subject of great speculation even today. Ultimately, Lawrence was a truly gifted, if at times insecure, man, asked to do a near impossible job in the most gruelling of conditions. That he did it well brought him unwanted fame, which he tried to shake off in this hidden corner of Dorset, where he also lost his life in a simple road accident on his Brough Superior motorbike. Though Lawrence the man is dead and buried at nearby Moreton, Lawrence the legend lives on. Even in death, conspiracy theorists speculated he had been assassinated and some believe it still. Perhaps the normality of his death contrasted too starkly with the dash and dare of his life. Either way, the demise of T. E. Lawrence laid to rest a great literary talent, a brave and influential soldier and a troubled soul. Though Lawrence the man is dead and buried at nearby Moreton, Lawrence the legend lives on. Even in death, conspiracy theorists speculated he had been assassinated and some believe it still....​"